RecoveryPump is a sequential intermittent compression device which speeds up recovery by increasing blood flow, venous return and effectively removes waste faster than traditional methods. RecoveryPump are the leaders in aggressive muscle recovery. RecoveryPump’s powerful sequential pneumatic gradient compression device is portable and highly effective for expediting recovery with a range of revolutionary garments for all body parts. It is the ideal recovery device for any athlete who is trying to reach their peak performance which is evident as so many top athletes use the product for muscle recovery and rehabilitation. The RPX Unit includes one or more garments depending upon the option chosen. The RPX System is a compression device for post workout recovery and rehabilitation, portable and compact. This top of the line model weighs just 2kg and features customisable program settings with a timer as well as an isolation mode option to target specific areas for treatment. RecoveryPump is used by Athletic Programs around the world and at every level of sports to help reduce the risk of injury and to treat athletes post injury/surgery. The RP therapy (gradient sequential pneumatic compression) is the only medically proven type of pneumatic compression to both accelerate recovery and increase athletic performance in subsequent exercise bouts. 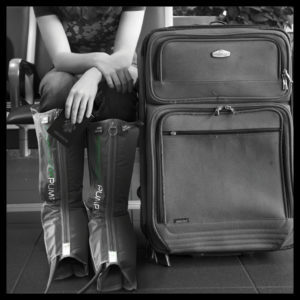 RecoveryPump’s unique boot design and quick cycle time actively engages the body’s natural return systems (venous/lymphatic) while at rest and keeps athletes feeling fresh during the grind of their season. 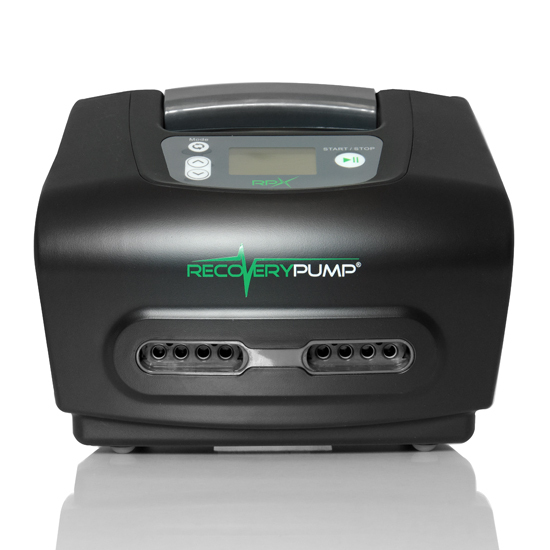 RecoveryPump is the most portable and affordable pneumatic compression system on the market. Not only is RecoveryPump more affordable than ever, but it is also about half the size and weight of competing brands. RecoveryPump offers the most innovative technology, the most Comprehensive Recovery Gear on the market – and a team committed to providing outstanding service to give you a winning edge. -8-Chambered RecoveryPants, providing compression to the sole of the foot, lower extremities,glutes,hip flexors,groin,lower back and abdomen. Carry bag for single system. When Do I Use the RecoveryPump? Every athlete has different training plans and the RecoveryPump system can adapt to that. The ultimate goal is to use the RecoveryPump system daily, when it’s convenient for you. Use the RecoveryPump before training or competition for 15-20 minutes to get blood moving and begin to dilate the vascular system. The effect is very similar to a warm-up jog but can be done at rest, without wasting valuable energy stores. Adjust pressure to personal comfort but we recommend 60mmHg for this 15-20 minute active recovery warm-up. If using the RecoveryPump immediately after a workout (while the vascular system is still dilated), we recommend 30-45 minutes use. If you decide to go about your daily activities and use it at the end of the day, 1 to 1.5 hours is recommended. Pressure – The pressure setting should be set to personal comfort and can be adjusted between 20mmHg to 80mmHg at any point during the therapy. Pause – The pause setting determines how long the RecoveryBoots stay deflated between fill cycles. For the fastest results this setting should be kept low- between 10 to 15 seconds. If you have a tingling feeling in your toes, adjust the pause setting to a higher number, allowing more time for blood to reach back into the feet before a subsequent compression cycle begins. 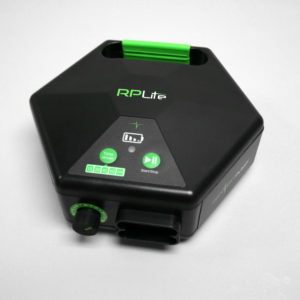 On/Off – The on/off switch is located on the side of the RecoveryPump and glows green when the device is plugged into an electrical outlet and switched on. Simply switch the button to ON when you’re ready to begin a recovery session and switch OFF when you’re done. Recovery Pump has been an integral part of our recovery protocols for a few years now. The portability, ease of use and long battery life makes it one of the most competitive compression garments on the market and suits our current protocols perfectly. This has led to many players purchasing their own boots for home use. This is a positive for us; as the players can take their own ownership of recovery. We would highly recommend the Recovery Pump and cannot speak highly enough of the service offered from RP-X Fitness too.